Do you have electricity supply at your area? If yes, chances are you have some air-conditioners and fridges at home, or at least any of these two. If that is the case, the next piece of information might be of interest to you. According to Bernama, the consumers can expect to get some kind of rebates for the purchase of high efficiency refrigerators, air-conditioners and chillers. It is a Government initiative to encourage the use of energy-efficient appliances and to improve energy efficiency in Malaysia. 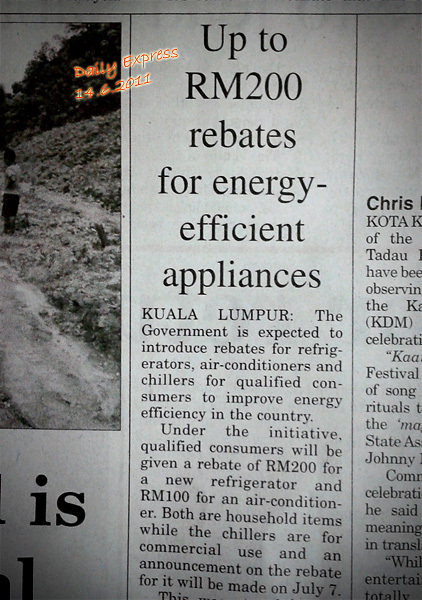 Qualified consumers get a rebate of RM200 for new refrigerator and RM100 for an air-cond. It is said to cost the Government more than RM50 mil. in 2011, so I recon it will be going on for some time. Energy-efficient household items are substantially more expensive - 30% to 50% more - but the rebates and the electricity consumed could well justify purchase of such appliances. The financial benefit can be realised (or ROI if you like) within two to four years depending on the level of efficiency of the item concerned. It mentioned qualified in the press release but did not elaborate on the criteria for an item, or a consumer to be deemed qualified. My guess is that the Government will come out with the details in July 2011 when it announce the rebate for chillers in the commercial sector. Let support the initiative and help mother earth avoid a little carbon emission. At the some time helping ourselves patching some small holes in our pockets. Our family currently uses nominal efficiency (non energy-efficient) air-conditioners and refrigerators but would seriously consider the high efficiency variants when the current ones are due for replacement. Any brand come with the rebates? Alv0808 > this is not brand-specific so any brand, as long as it meets the Ministry's criteria would enjoy such rebates. Question is, what criteria. Worry not, electrical appliances shops would be able to tell their customers which items come with the incentive. Hopefully soon. I could found out excellent and useful information from you guys.I appreciate your work here.Thanks.